Winning an award at the Kansas City Barbecue Festival wasn't enough. In April, he was crowned as the highly coveted NYC Brisket King 2017 . The new king, Izzy Eidelman of I zzy's Brooklyn Smokehouse , is in fact a deserving champion who has been making outstanding BBQ for several years. What started out as a hobby just became a brick-and-mortar restaurant as the creator of Izzy’s BBQ Addiction recently opened a smokehouse in Brooklyn, NY. 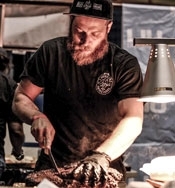 A Brooklyn native, Izzy Eidelman learned how to smoke kosher meats using a wood-fired grill in the backyard of his parents' Brooklyn home — where he began selling his unique barbecue via delivery and catering last year. His Facebook page, which allowed people to place orders for brisket, smoked chicken and ribs, got so many hits that his business soon outgrew his parents' space. “I was just a backyard griller,” Eidelman said of the old operation, where he could only smoke up to 30 pounds of meat at a time and would often sell out in a day. Izzy and his team serve up some wonderful pastrami brisket and regular brisket, both of which have a lot of flavor and an intense rub of pepper, salt, and likely other spices. If you've never made it out to Izzy's, you should. It's worth the trek to see how Izzy has been inventive with BBQ even while being limited by keeping kosher.